I recently sold my 2005 Honda Civic Type R (EP3) and bought a 2005 VW Mk5 GTI in the hope of moving to something a little more torque-y and refined. Well anyway, during that enjoyable period I noticed that when the car was up to temperature it would slightly stumble occasionally on idle, most "non-car" people wouldn't have noticed it, but anyone into their motors would. I did not experience any hesitation or loss of power, but after scaring myself with stories of compression loss and head gasket failure I decided the first sensible option would be to change the coil packs and spark plugs. Before I had a chance to fit these the misfire got much worse and finally conked out and wouldn't run at all. Luckily I had an OBDII bluetooth adapter and Torque for Android which enabled me to read the OBDII fault codes to get a better idea of what was going on. Coil A = Cylinder 1 so at least that seemed consistent. 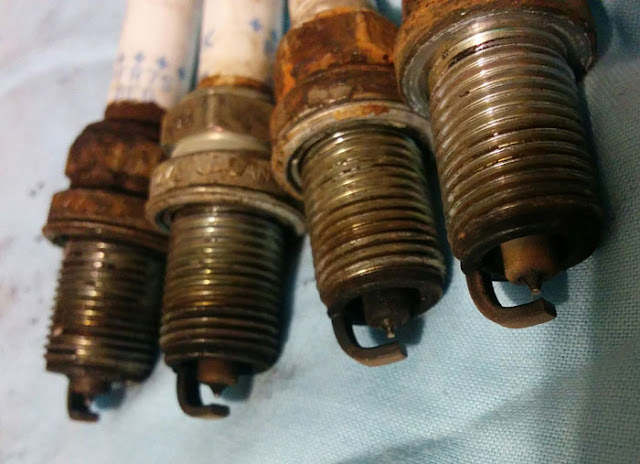 However, still not conclusive that this is a coil or spark plug issue. I changed the spark plugs first but this made no difference. The old plugs and coils were pretty filthy though with lots of corrosion build up pretty much everywhere where you don't want corrosion build up. After changing the coil pack on cylinder 1 the engine fired straight up and the misfire disappeared.